We’d love your help. Let us know what’s wrong with this preview of So Much More by Debra Rienstra. To ask other readers questions about So Much More, please sign up. 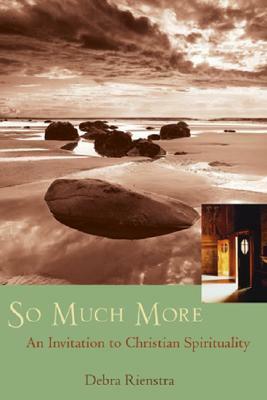 At the conclusion of "So Much More," Calvin College professor of literature Debra Rienstra cautions and invites us: "We cannot master the mysteries; we can only place ourselves continually in their presence.... It's not so much that we understand the mysteries more clearly but that the mysteries have their effect on us, slowly molding us over time." This lovely book, artfully written without any apparent striving or archness, sets out the basic mysteries of the Christian faith in a Reformed regis At the conclusion of "So Much More," Calvin College professor of literature Debra Rienstra cautions and invites us: "We cannot master the mysteries; we can only place ourselves continually in their presence.... It's not so much that we understand the mysteries more clearly but that the mysteries have their effect on us, slowly molding us over time." This lovely book, artfully written without any apparent striving or archness, sets out the basic mysteries of the Christian faith in a Reformed register. As such, it is not so much about "spirituality" (a slippery term) but about what Calvin called "piety": "that reverence joined with love of God which the knowledge of his benefits induces." Rienstra sets out the basic truths of the gospel and life in response to those truths in a clear, frank, and winsome style that invites the inquirer as much as the seasoned believer to reverence: awe, gratitude, trust, deference, obedience, enjoyment, and love. The Christian Story provides the framework for her exposition of the gospel and the Christian Life is outlined in terms of prayer, Scripture, worship, community, and service. So far, so good--and so conventional. But Rienstra quietly and deftly draws us into each theme with an extraordinary balance of unusual expression within a conversational vernacular, and theological freshness nicely steered within orthodox parameters. I have tweeted numerous gems from this book over my reading of it, but the overall effect is even more salubrious (and Rienstra is wise never to use a word like "salubrious"): a friendly welcome into a deeper life with God through Christ in the Spirit. The book thus works remarkably well as an apologetic for inquirers, a primer for beginners, and a refresher (in every sense of the word) for veterans. Don't be put off by the boring cover and rather dull title. This book sparkles, soothes, and stimulates by turns and richly repays slow reading.